Jake at Black Rock (my family isn't big on getting their pictures taken). It's been a busy weekend. We went up to Lewiston Friday night and camped overnight for the Little Red Riding Hood ride that my wife was participating in. I like visiting small towns and we had a lot of fun. On our way home we stopped by Hyrum Reservoir. It was pretty crowded and there was one guy with a wetsuit in the water swimming and floating around. I really wanted to get in and swim, but we were all starving and decided to get some late lunch. I texted Jake on our way home to see if he wanted to go down to the Great Salt Lake for a quick swim. It was such a nice day today that I needed to spend some time in the water. We had to modify the one mile course for the Great Salt Lake Open Water Swim due to rising water levels and another event happening the same day. 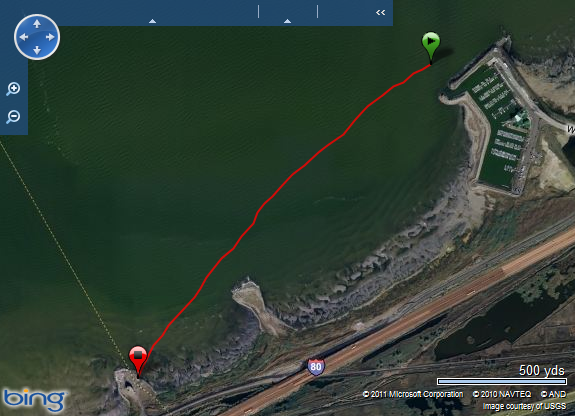 I wanted to swim the new course to check the distance with my GPS and also to see first hand what our swimmers will see. We parked my van at Black Rock and then Jake drove us back to the GSL Marina. Once at the marina, we quickly stripped to our suits and waded into the water. It felt cold at first, but it didn't take long to get comfortable in it. We swam out of the marina and out to the starting buoy. I started my GPS and we were off. It was a beautiful evening out on the lake. There were several sailboats out on the water enjoying the good weather. The water was very pleasant for about a foot and cooled off significantly after that. One mile race course viewed from the Great Salt Lake Marina. When my hand started scraping the sandy bottom, I stood up and walked the rest of the way to the finish line. When I got to Black Rock, there were a lot of people there. A group of them started yelling and walked over to where I was getting out of the water. It turned out to be a group of Girl Scouts. They had seen our bright orange caps in the water and had been watching us. Their leader could not believe that we were swimming in the lake. The girls and their leader asked us quite a few questions about the lake and swimming and it was fun talking to them. Finish line for the Great Salt Lake Open Water Swim. Antelope Island to the left and the Great Salt Lake Marina to the right. When we got back to the marina, we saw a guy walking down to the beach with a fishing pole. WTF?! We walked out to the end of the marina to have a look at the starting buoys and the race course and saw another guy fishing! I don't know what they were hoping to catch, but there isn't anything out there other than brine shrimp. I caught Dave Shearer, the Great Salt Lake Marina Harbor Master, at his office and give him a copy of our permit application. I think we are all squared away now. It was a great evening and I'm glad Jake was able to come out and swim with me.